Habit at Kanaio Beach, Maui, Hawaii (USA). December 23, 2004. 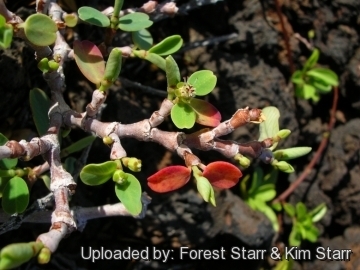 Origin and Habitat: Euphorbia celastroides is endemic to all the main Hawaiian Islands (Kauaʻi, Niʻihau, and Nīhoa). It is locally aboundant on low elevations. Altitudinal range: This species is found from the coast to upland mesic forest. 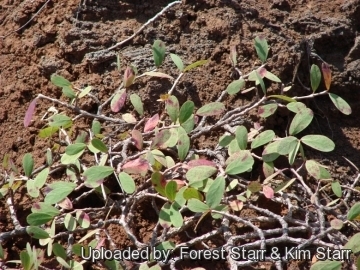 Habitat and ecology: Euphorbia celastroides is tolerant of drought and grows in dry, scrubby areas and sparsely wooded slopes, inland as well coastal often on calcareous soils. On Nīhoa it is a common component of the vegetation found on ledges and grassy slopes. 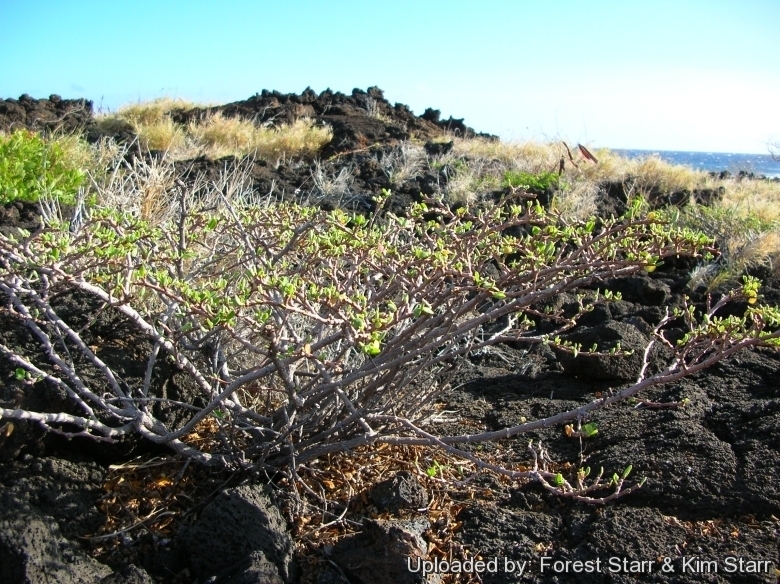 This variety forms dense stands alone or mixed with pōpolo (Solanum nelsonii) and ʻilima (Sida fallax). The majority of the seabird Christmas shearwater (Puffinus nativitatis) that breed on Nīhoa, nest in ʻakoko thickets or the tufts of the grass kāwelu (Eragrostis variabilis). Due to its endemic nature, it is very vulnerable to human threats. Two examples of such threats are four-wheeled vehicles (which crush the plant) and introduced species (which compete for resources). One variety, Euphorbia celastroides var. 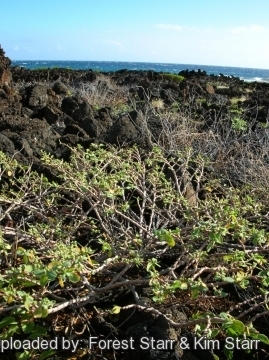 kaenana, found at Ka'ena Point, Oahu, is federally listed as endangered. 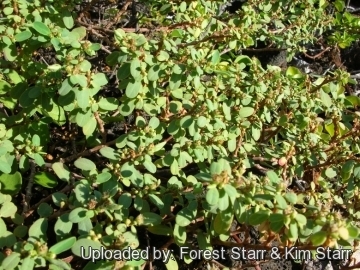 Description: Euphorbia celastroides, previously also known as Chamaesyce celastroides, is a species of spurge that grows as a medium-sized evergreen shrub or small tree reaching at most 1-2 m in height and diameter. This species develops into a round-shape shrub, both glabrous and pubescent forms are known. While the flowers are not showy, the bright pinkish to red fruits can be uniquely appealing en masse. It is by far the most variable and widespread of all Hawaiian Chamaesyce and there are at least 30 described varieties that in all probability they can all be included within the variation of the one species. 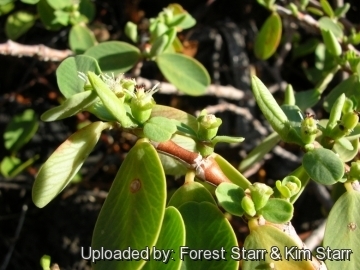 The erectly held capsules distinguish it from all other Hawaian Chamaesyce except Chamaesyce herbstii and Chamaesyce rockii, which have distinctive large fruit. Euphorbia celastroides var. celastroides The leaves are of this variety are glabrous (without hairs) and narrow. 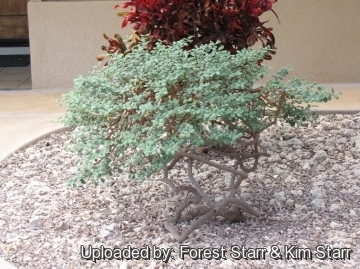 Stems: Slightly succulent adapted to store water, forming a loosely branching short trunk. The secondary or young branches are stiff, with short internodes. A milky, sticky latex naturally oozes from wounds. Leaves: Small, distichous (growing in two vertical rows) and may have a glaucous coating. Often the leaves in the summer assume a red-violet colouring. 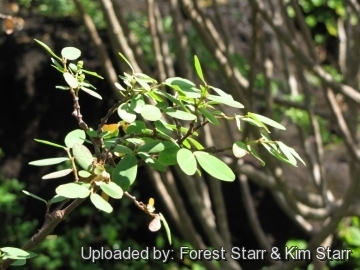 It does not lose its leaves in the winter, due to the warm climate of its range, but may shed the leaves in dry, hot weather. Damaged or old leaves turn a blood red as they die. Phenology: Euphorbia celastroides produces flower and fruit repeatedly throughout the year. 14) Native Plants Hawaii. “Euphorbia celastroides var. celastroides” <http://www.nativeplants.hawaii.edu> Web. 27 Sep. 2014. Cultivation and Propagation: Euphorbia celastroides or akoko is an attractive tropical species that requires temperatures of 15 °C and light shade. 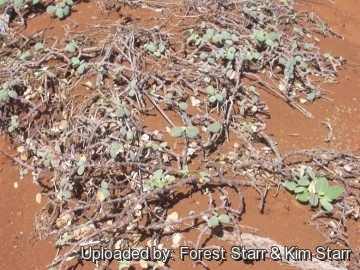 This plant develops in a fashion similar to a shrub and is tolerant of heat and drought. Though this variety is seldom seen in cultivation, it is a beautiful addition to the landscape and rather easy to grow.